A sculptural group representing the domestic slave trade is one of several instlations leading to the Memorial Square at the top of the hill on the six acre National Memorial for Peace and Justice. Note: Last week this blog was winding up our National Poetry Month series and missed covering this important event. 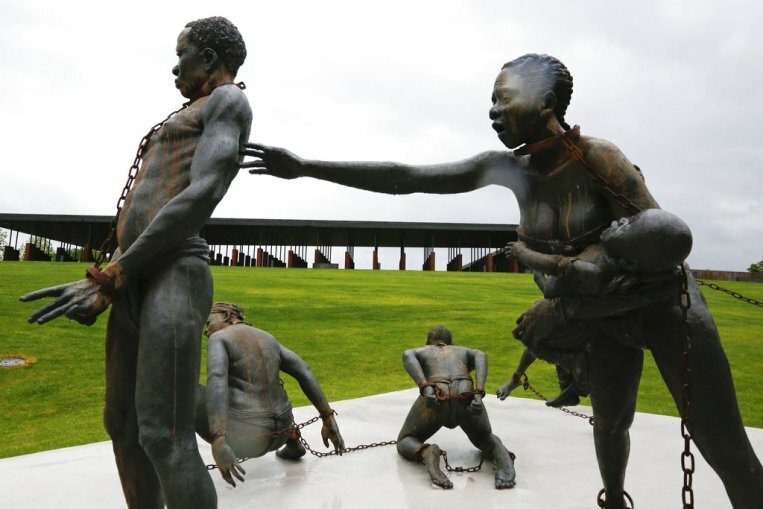 The new National Memorial for Peace and Justice—already popularly called simply the Lynching Memorial—opened on April 26 in Montgomery, Alabama along with a companion Legacy Museum: From Enslavement to Mass Incarceration. No mere historic marker, or modest statue, the Memorial is as massive and overwhelming as the crimes and victims it remembers. Set on a six-acre site, the memorial uses sculpture, art, and design to contextualize racial terror. 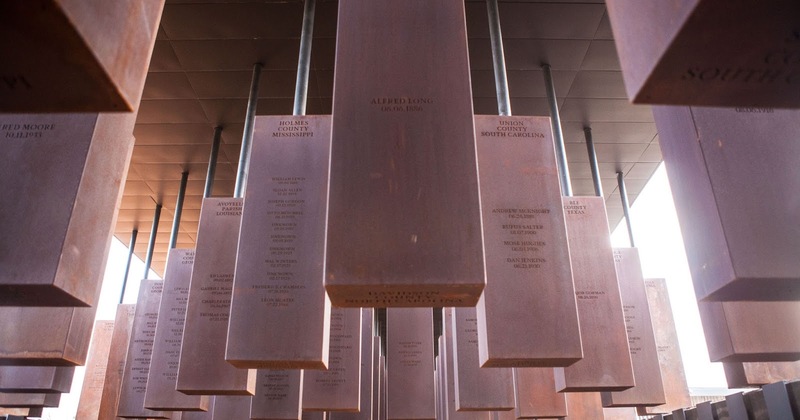 The site includes a memorial square with 800 six-foot monuments—one for each county in the United States where a racial terror lynching took place. The names of the lynching victims are engraved on the columns. The memorial is more than a static monument. In park surrounding the memorial is a field of identical monuments, waiting to be claimed and installed in the counties they represent. Over time, the national memorial will serve as a report on which parts of the country have confronted the truth of this terror and which have not. 800 six-foot monuments are inscribed with the known name of victims and suspended in the the Memorial Square, each one representing a county where a lynching took place. Also on the grounds sculptures take visitors on a visceral tour of the Black experience in America—subjugation by terror and humiliation from the stark brutality of the Middle Passage, to the auction block, chattel slavery—leading to the central pavilion and then continues through the depredations of the Civil Rights era to the contemporary extension of the violence and oppression through police violence and the racially biased criminal justice system featuring the mass incarceration of Blacks. Among the artists who contributed to the experience were Kwame Akoto-Bamfo whose sculpture on slavery confronts visitors when they first enter the memorial, Dana King dedicated work to the women who sustained the Montgomery Bus Boycott, and a final work created by Hank Willis Thomas. The journey also displays writing from Toni Morrison, words from Dr. Martin Luther King Jr., and a reflection space in honor of Ida B. Wells, the Black journalist who exposed Jim Crow Era lynching and crusaded for justice. It is not the kind of monument a visitor can take in at a glance, or that encourages selfies using it as a background prop. Instead it is a totally immersive experience that some visitors have compared to the overwhelming emotional punch of the Holocaust Museum in Washington, D.C.
Just a few blocks away the complementary Legacy Museum opened the same day situated on a site in Montgomery where enslaved people were once warehoused, a block from one of the most prominent slave auction spaces in America, and steps away from an Alabama dock and rail station where tens of thousands of Black people were trafficked during the 19th century. The Legacy Museum, companion project to the Memorial. The Legacy Museum employs unique technology to dramatize the enslavement of African Americans, the evolution of racial terror lynching, legalized racial segregation and racial hierarchy in America. It relies on first-person accounts of the domestic slave trade and critically acclaimed research materials, it employs videography, exhibits on lynching and content on segregation, down to the contemporary issues from mass incarceration to police violence. Visitors enter the museum and confront slave pen replicas and continue the richly illustrated journey from there. Sculptures including Titus Kaphar and Sanford Biggers and fine art pieces including works from Elizabeth Catlett, John Biggers, Yvonne Meo, and Kay Brown enrich the experience Design and creative partners also included Local Projects, Tim Lewis and TALA, Molly Crabapple, Orchid Création, Stink Studios, Human Pictures, HBO, and Google. 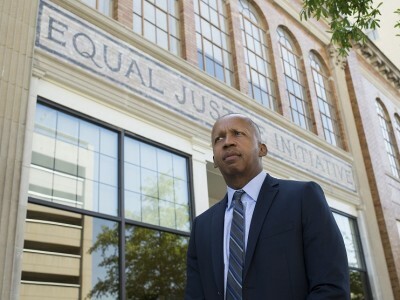 Equal Justice Initiative founder and visionary leader Bryan Stevenson in fron of EJI's Montgomery headquarters. The two projects, each impressive enough to be a major cultural achievement on its own, owe their seamless connection of history to the realities of today to their sponsor, The Equal Justice Initiative (EJI) which is committed to ending mass incarceration and excessive punishment in the United States, to challenging racial and economic injustice, and to protecting basic human rights for the most vulnerable people in American society. Founded in 1989 by Bryan Stevenson, a widely acclaimed public interest lawyer and the best-selling author of Just Mercy, EJI is a private nonprofit organization. Beyond the memorial and museum, it is dedicated to helping the poor, the incarcerated, and the condemned and provides legal assistance to innocent death row prisoners, confronts abuse of the incarcerated and the mentally ill, and aids children prosecuted as adults. The museum will be an unparalleled resource for researchers housing the nation’s most comprehensive collection of data on lynching. It also houses previously unseen archival information about the domestic slave trade brought to life through new technology. Decades of hard work, research, design, fundraising, and gathering support from sometimes reluctant local and state officials who would rather “let sleeping dogs lay” went into the creation of the twin projects. 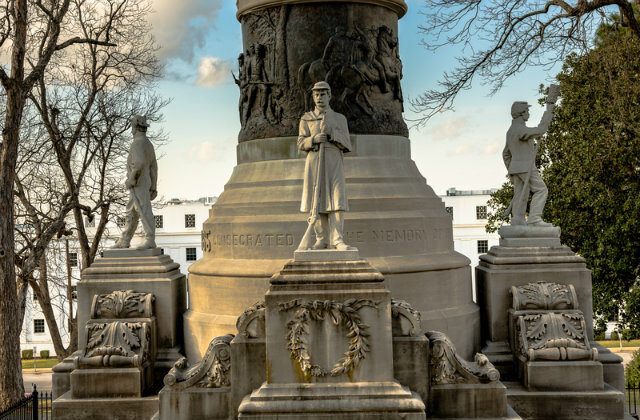 Perhaps not entirely by coincidence, last year the State of Alabama passed a law protecting Confederate monuments like this one from being moved or even modified to reflect the realities of slavery. 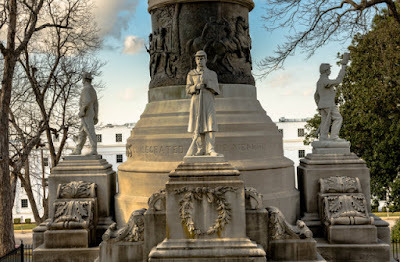 Montgomery is a city dotted with Confederate memorials including just a mile from the Memorial the “First White House of the Confederacy” celebrating the life of “renowned American patriot” Jefferson Davis. Not only was it a cradle and regional hub of the domestic slave trade, it was ground zero of the Jim Crow South and the virtual capital of lynch law. Naturally, it was also at the heart of the Civil Rights Movement and resistance to it. The Montgomery Bus Boycott was the first major successful campaign of non-violent resistance movement which brought Martin Luther King to national prominence. The Rosa Parks Museum is also near-by. Montgomery was the goal of the voting rights marchers from Selma and eventually the site of a triumphant rally on the steps of the Capital. But it was also where Governor George Wallace declared, “Segregation now, segregation tomorrow and segregation forever!” and the Ku Klux Klan operated with impunity. While Alabama and the other states of the old Confederacy had epidemic levels of lynching, Northerners should not feel smug. Among those counties with victim’s names etched on them are places in Minnesota, for instance, where four carnival roustabouts were lynched in Duluth after a teenage girl out late with her boyfriend made up a story about being raped. Also represented were victims strung up to lamp poles in Chicago during the 1919 Race Riot. 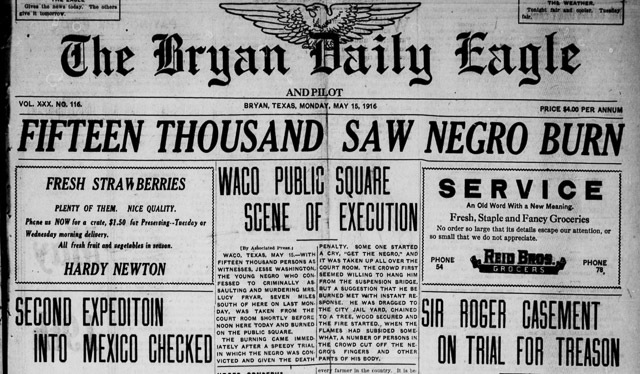 The normalization of sensational cruelty--coverage of a lynching by fire in Waco, Texas. 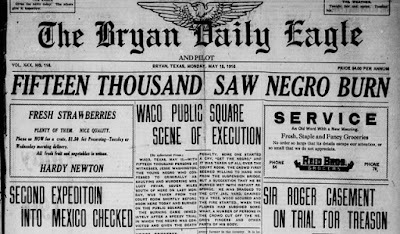 While most people associate lynching with the Strange Fruit that Billie Holiday sang about, hanging was not the only method. As historian E.R. Bills documented in his book Black Holocaust: The Paris Horror and the Legacy of Texas Terror, the Lone Star State made something of a tradition of burning victims alive in gruesome public executions, but similar “barbeques” where held elsewhere. Emmet Till, the 14-year old Chicago boy was beaten unrecognizable, shot, tied to a 70lb cotton gin fan, and thrown in a river in a case that became a cause celebre. Several Civil Rights workers and volunteers, most famously Andrew Goodman. Michael Schwerner, and James Chaney but including less celebrated victims, were kidnapped and executed by Ku Klux Klansmen and other night riding terrorists. As recently as 1998 James Byrd was dragged to death behind a pick-up truck by White supremacists in Jasper, Texas. No form of torture was too cruel for enraged racists. 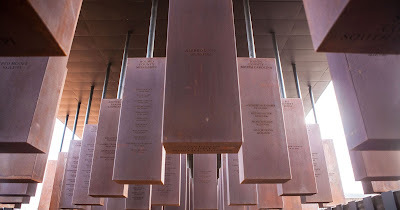 Although the Memorial and Museum are dedicated to Black victims, it is important to recognize that other minorities and marginalized people have also been targeted. Lynching as a tactic of terror, intimidation, and subjugation was useful against other groups. In Texas and the Southwest Mexican-Americans and immigrants alike were targeted on a massive scale for decades. 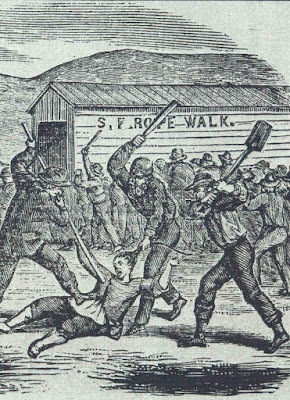 Some were victims of extra-judicial mobs, but others were systematically hunted and slain by the famed Texas Rangers under a tissue thin cover of law. In all parts of the country Native Americans have frequently been lynched and in fact more than one Indian war was set off when settlers murdered tribal members for alleged offenses or simply because the could do so with impunity. Chinese men were sometimes choked with their own hair queues during the Yellow Peril riots that swept the West in the late 19th Century. The Chinese were just one other minority attacked by lynching. Today some of the murders of gays, lesbians, and transgender individuals, as well as fatal attacks on immigrants and the homeless, have characteristics of lynching—not the acts of lone wolf bigots, but the concerted acts of groups or mobs. Finally, it is very important to place lynching in the continuum of oppression that is on-going. The #BlackLivesMatter Movement has shown that murder under the color of law is not a relic of those old Texas Rangers, but a continuing plague in our cities just as mass incarceration is the new slavery. Thanks to the National Memorial and Legacy Museum for reminding us.